Need an instant cash? Check out Lenddo! I was invited by a co mommy blogger to check out Lenddo before. At first, I thought it was odd because it used social networks to assess credits, it’s the first of it’s kind for me, so I checked out their website to know more about it. Since signing up is free, I did not hesitate to become a part of it. I learned while browsing the site that they gave funds for business loan, education loan, medical emergencies, home improvement loan and career related expenses (i.e. moving costs, supplies or training) and they can even help you in debt consolidation. 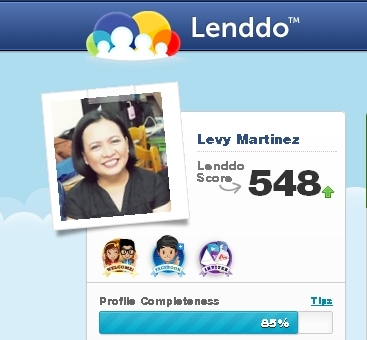 Note: The more Lenddo knows about you, the higher your Lenddo score will be. Be sure that your family and friends also have a minimum of 400 points since that is also one of the requirements before a loan can be approved. You can borrow from a minimum amount of Php 5,000 to a maximum of Php 43,000. The interest rate I think depends on your Lenddo score and local rates and terms ranges from 3 months to a year. The good thing is that they provide a loans calculator to give you an idea on how much your monthly amortization will be. The loan process only takes 1 business day as long as you have completed all the necessary requirements. Since this system is kinda new to most of us, it would be nice if the website has a live chat to answer the questions of the members fast. I don’t suggest you to have a loan if you don’t need cash that much, but I think it would be nice if you have a back up plan in case of an unexpected situation. Building your network as early as now at Lenddo is a good idea so that if an emergency ever arises, you are all set to request for a loan. What to do when your Facebook account has been suspended? I signed up with Lenddo last year too. Thought it would be nice to have a backup just in case. I do have over 400 points, but haven’t gotten around to using it to avail of a loan just yet. Only when I really, really need it. earn your points to avail of the benefit. Is this Philippine-based sis? Interesting…will take a look. I think it’s for Philippine-based only. pude…. bagong trend for the loan.. galing..
Uy, this is interesting and looks helpful talaga. Wala kang i-invest na money? Mag-build lang ng reputation? I have tried loaning with them and you would soon know when it’s approved or not. Its so difficult to have your loan approved here. And they would have access to all your information. Be careful nalang. Hi! Iam a Lenddo member and already got 600+ points, but I wasn’t be able to apply for a loan yet since one of the terms and conditions is you need at least 3 trusted network with all 400 points to approve for a loan…just for FYI… Thanks!